Tubes: naisemulheres150 \12_abstrait_animabelle \ GG09~AfricanViolets_001. Deco:deco1lc \ deco2lc \ deco3lc. Unlimited 2 &<BKg Designer sf10I >. Plugin Alien Skin Eye Candy 5: Impact. 1-Abrir alphachannel_lc, fazer uma cópia, fechar ( minimizar ) a original. Preencher com uma cor retirada do misted ( #819bb6 _ procure uma cor clara ). _ Select All. Edit Copy no tube12_abstrait_animabelle \ Edit Paste Into Selection . Selections\ Select none. _Effects \ Image Effects \ Seamless Tiling _ Default \Transition 100. _ Adjust \ Blur \ Gaussian Blur . R= 28,00. _Preencher com uma cor mais escura ( #4e5d70). _Effects\ Artistic Effects \ Chrome. _Blend Mode= Overley . Opacity 73%. _Adjust\ Add/ Remove Noise \ JPEG Artifactal Removal... ( Maximum\ C=78) . 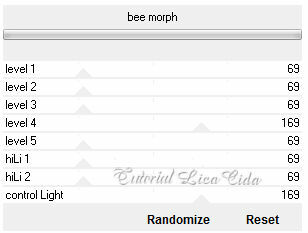 3-Unlimited 2 &<BKg Designer sf10I > \ bee morph. _Selection\ Load Selection from Alpha Channel Selection #1. 7-Plugin dsb flux\ Blast . Usar as duas opções. 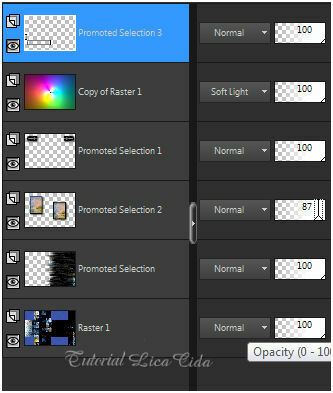 9-Voltar a layer superior ( Promote Selection ) . _Selection\ Load Selection from Alpha Channel Selection #2. 10- Selections\ Modify \ Contract 25 pxls. _ Effects \Reflection Effects\ Pattern. *Plugin Alien Skin Eye Candy 5: Impact\ Glass... (use a gosto). _Selections\ Select none. 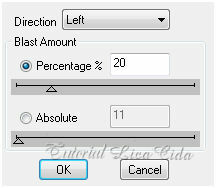 Resize 60%. _ Effects\ Image Effects\ Offset . H= (menos) -449 \ V=103 . Custom e Transp. _Layer\ Arrange \ Move Up. 13- Selections\ Modify \ Contract 12 pxls. _ Effects \Reflection Effects\ Pattern ( veja print ítem 10). 14-Edit Copy no tube12_abstrait_animabelle \ Paste As New Layer. _Posicione a gosto . Invert_Delete_ Invert. 15-Effects\ 3Deffects\ Chisel. ( print ítem 11 ). 16- Voltar a ativar a Raster1. _Selection\ Load Selection from Alpha Channel Selection #4. 17- Selections\ Modify \ Contract 12 pxls. 18-Effects\ 3D Effects\ Chisel. ( print ítem 11 ). _Effects \ 3D Effects \ Drop Shadow 0\ 20\ 80\ 0. Color=ffffff. _Layer \Arrange \Bring to Top. 19- Copio a layer Raster1. Image\ Canvas Size 950 x 750. _ Selecione. 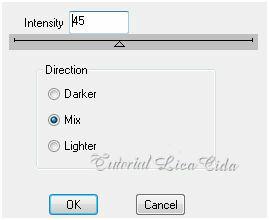 Nova layer\ Edit Paste Into Selection \ Selections\ Select none. 20-Plugin MuRa's Meister \Perspective Tiling. Default. _Usar a ferramenta Pick Tool e descer o efeito ao back do top. 21- Ativar a layer Promoted Selection. 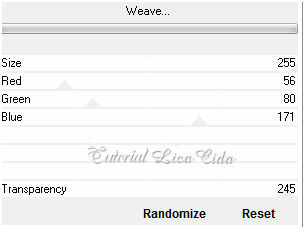 -Edit Copy nos decos: deco1lc \ deco2lc \ deco3lc\ Paste As New Layer. 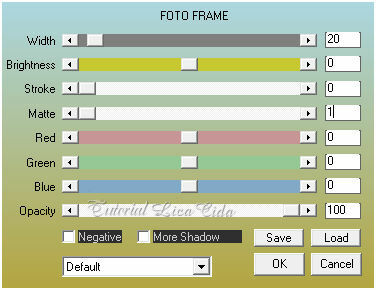 * No deco 2lc: Effects\ Image Effects\ Offset . H= 71 \ V=49 . Custom e Transp. 22- Ativar a layer superior. _Edit Copy nos tubes: naisemulheres150 e GG09~AfricanViolets_001\ Paste As New Layer. 23-Image add borderes 1 pxl \ cor mais escura ( #4e5d70). _Image add borderes 40 pxls \ cor mais clara (#819bb6). 24-Plugin dsb flux\ Bright Noise... ( print ítem 6 ). 25- Plugin \ AAA Frames . Aparecida \ licacida , abril de 2017.